A brave or a foolish death? It is 8 on a February morning. Around me, 100 Tibetans are seated on the stone paving in front of a temple. The temple is in a cramped square with a canopy of fluttering prayer flags. The hypnotic murmur of Buddhist chants floats over the sounds of drums and cymbals from inside. On the steps of a house on the right of the square, two elderly Tibetan women chatter as they spin their hand-propelled prayer wheels. Nearby a small girl, no more than eight years old, plays with a tiny dog in the corner of the square. Her rosy weather-beaten cheeks contrast with her bright green checked jumper, and give her the look of one who has lived an outdoor life on the Tibetan plateau. But this is New Delhi in India, not Lhasa in Tibet. It is the Tibetan Colony of Majnu Ka Tilla, on the banks of the Yamuna River in the north of the city. The colony is just as, if not more, important to the exiled Tibetan community in India than the better-known Dharamsala, official home of the Dalai Lama and the Government-in-Exile in the hills of Himachal Pradesh. While Dharamsala offers a climate closer to the high plateau of Tibet, Majnu Ka Tilla offers the irresistible promise of opportunity. A boy in his late teens, dressed in a shiny tracksuit and carrying two broad-based kettles with high spouts, weaves in and out of the worshippers offering them sweet or butter tea. It is the butter tea that most people choose. He comes to me. I smile apologetically as I choose the sweetened pot. Despite a number of valiant attempts to make friends with butter tea, I cannot get used to the thick taste and the globules of fat floating on the top of the brown liquid. As I sip from my thin melting plastic cup I notice a row of printed pictures and names on them hanging across the top of the temple, competing with the prayer flags and the Free Tibet pennants. It takes a few seconds to register that a number of the pictures are of burning bodies. One is of a charred shape that must also be a body. These are pictures of 13 Tibetan monks who have set themselves on fire – “self-immolated” – in protest at the situation in their homeland and continued direct Chinese rule. Since self-immolation is suicide, and therefore involves taking life, it has caused some divisions in the Tibetan community; but no-one doubts the commitment of the self-immolators, nor the horror of the manner of death, which shout of the desperation and impotence felt by many Tibetans. It would be impossible to list the chain of events that have brought me here. The immediate cause lies in a visit to Dharamsala three days previously. As I researched my book, a visit to the Tibetan Museum threw up a number of names of freedom fighters who might still be alive. I tried the names on my friend Torty Conner. I had only known Torty for a few days but I’d already realised that, after nearly a decade living in Dharamsala, she knew her Tibetan onions so to speak. A few hours later I climbed the steps to the temple in Mcleod Ganj, the town that perches above Dharamsala. In the temple that stands in front of the Dalai Lama’s residence four Tibetans performed repeated prostrations in an attempt to get closer to the essential power of the world. Beyond them I spotted three likely looking hulking men standing by the entrance to the residence. I approached them. “Um… I’m looking for Dawa Ngawang, son of Ratu? Is he here? There was a rustle as phones emerged from pockets crushed up against things the size of tree trunks. Two minutes later I walked away with the number, which led to another number, and then another number, and finally a conversation with Ratu Ngawang’s daughter, Deckyi. Yes, an interview was possible, but at 86, she warned, he only functioned well in the mornings. I should come to the Temple square in three days time. I hesitated, before confessing that the Tibetan language is not one of the strings to my bow, let alone a dialect from Kham, the China-Tibet borderlands renowned for it’s tough, uncompromising people. Was this the end of the road? Deckyi, used to this, offered two hours of her own time to translate. The meeting was on. In the Majnu Ka Tilla square I make enquiries of the tea boy and receive instructions in broken English to get to the Ngawang house. He gives up. Within seconds the tea is forgotten and we are swerving quickly through narrow alleyways. I get the feeling that he’s quite keen to go down to the Ngawang house. The door opens and my guide slips away as I am ushered into the home by Ratu’s wife and by Deckyi. Down a corridor I see a man raise himself from a low bench. He is dressed in a sweater and track-pants. He is not tall, but at 86 he is clearly still remarkably fit. As he approaches me he stretches upright and grabs my hand. We seem to find something in each other’s eyes and both smile. Deckyi takes her seat between us to translate as Ratu and I beam at each other. It is disconcerting how comfortable I feel. As the interview begins, the story of Ratu’s life starts to emerge. Soon we are in the 1950s when Tibetan Freedom fighters in Kham formed into the infamous guerilla organization the “Chushi Gangdrok”. 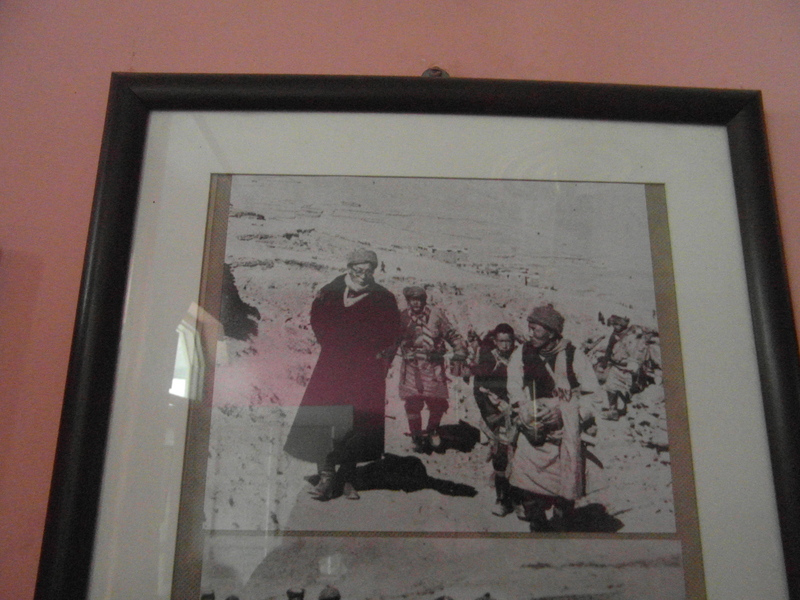 As he starts to tell me of his own role, and of the hair-raising story of the flight from Lhasa in March 1959, he points to the wall. It is a picture of the 24-year-old Dalai Lama and the compact Ratu striding up a mountain pass in the Tawang district, the route they took as they fled. They are both wearing thick woolen tunics to protect from the night-time cold. Ratu tells me that with the Chinese troops nearby, moving in daylight was not to be advised. He goes on to tell me of his role with the SFF (Special Frontier Force), the Indian special forces group that recruited Tibetan fighters to fight with the Indian army and later became a shadowy organisation called Establishment 22; and of the little known role of Tibetans fighting alongside the Mukti Bahini in India’s 1971 war with Bangladesh, marching through the Chittagong jungle with heavy packs, treating chafed shoulders with gun oil. 49 of his countrymen were killed in a little-known fierce battle. After two hours his eyes start to droop as he starts to tire. He looks me in the eye and says something in Tibetan. Deckyi translates. It is time to leave. As I turn off my tape recorder and pack my bags, he produces two books. It is his life story, recently written up in Tibetan in two volumes by the Amne Machin Institute in Dharamsala. He signs them and gives them to me. I think of what a trans-national publishing opportunity that might be for some enterprising UK publisher. I say my goodbyes and Deckyi walks me back to the square. As I thank her she looks at me with a glint in her eye. And with that she turns on her heel and walks off, leaving me begging for more. As I look up at the temple again I am left pondering the ways that people fight for what they believe in and the brave choices people make – to live, or to die. This is a great addition to your writing. 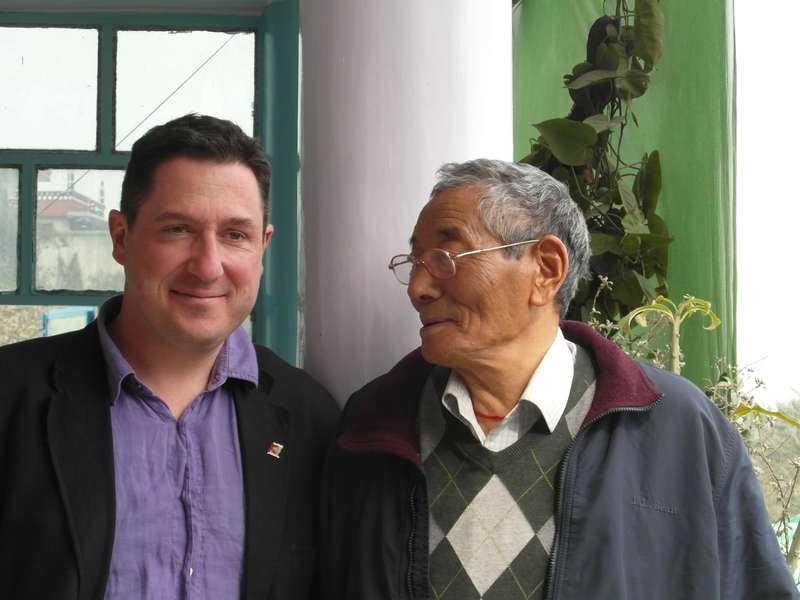 I stayed in Majnu Katilla on my way back from the first trip to Dharamsala, and our son celebrated Losar there a few years back with Tachi Wangdula, the Dalai Lama’s representative and good friend of Lhamo Pemba who you met in Sikkim. What is the title and subject of your book-in-progress? I look forward to it. I just returned from Montessori work in the West Bank, and exploring Petra and Berlin on the way home with my husband. See pictures on facebook.